Accutrak successfully demonstrated in 1985 a pre-programmed, auto-steering system that allowed a tractor to pull a 30-foot cultivator over a field without a human driver. The historic test by the Regina-based company was captured on film by CBC television and broadcast nationally on the popular agriculture show called Country Canada. 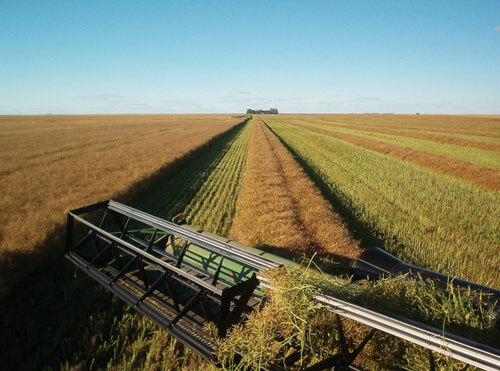 Since the test in a field near Southey, about 45 km north of Regina, Accutrak has continued to refine its proprietary auto-steering product with a pair of industry giants—John Deere and Caterpillar Tractor. Steered by Ron Palmer, its founder and president, Accutrak pioneered development of the auto-steering navigational products by applying Global Positioning System (GPS) technology to farming practices. Utilizing clusters of satellites orbiting the globe around the equator, GPS can help farmers pinpoint a position in their field to within one metre. Accutrak’s auto-steering products improved upon the GPS guidance systems employed in the industry by taking on the task of ensuring tractors steered along parallel lines. The operator is left only with the task of turning at the end of each field or steering around obstacles; as a result, savings of 10% or more each year amount to millions more dollars in farmers’ pockets.